I am sorry to announce that I will no longer be able to make Hitty Houses. Many factors have contributed to this decision which are first that I no longer have any workers who can help with the construction or the packing and shipping. Also, the materials have to be ordered specially and picked up 50 miles from here and the final blow came when the UPS charges to ship the the last house exceeded $100 not including my (yes, me, the only shipper here) shipping time nor the materials to ship it safely. 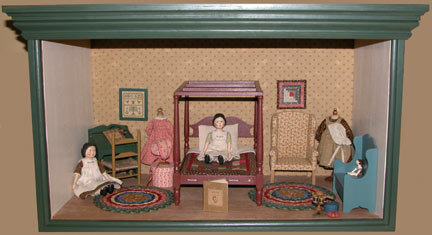 I recommend instead a slightly larger (side to side) version of a box shelf house I produced many years ago for my Early American Doll Series. Click below for free plans and hire a local cabinet maker or hobby carpenter to make one for you. Note that the plans below will make a house about 8" wider and 2" deeper than the Hitty House which will allow for most or all of the pieces of the now expanded Hitty Series. Hitty's House has lift off lid, lift out glass front and interior lighting. OTHER SUGGESTIONS FOR HITTY HOUSES: Find barrister bookcases which have lift fronts (glassed-in) and can be stacked. Or find an unfinished furniture place and get a 3 shelf bookcase which you can paint and wallpaper. Or, my favorite make-do is to buy a wooden sash window (come in all varieties of multiples of panes of glass and sizes), then build a simple 2-3 floor "bookcase" from 1 x 12 pine lumber where the window sash will be hinged like a door. LIGHTING: Nowadays it's easy (and safe) to put lighting in doll settings. Get LED ribbon lighting in warm white (you don't want the reg LED color which is on the blue side) and the transformer to hook it to (look on Amazon as electric supplies charge 4-5x the price). The ribbon even has a peel off self stick and is very low profile and about 1/2" wide. Make sure to put it where you are not looking at it - this may mean adding a wood fascia under the "ceiling" for it to hide behind.